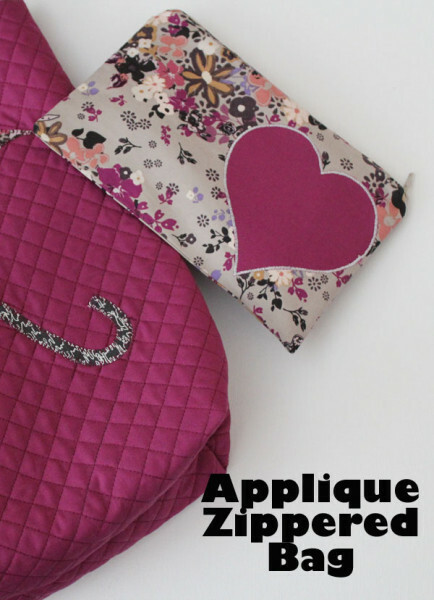 I’m on a little applique kick, making some samples, and I thought I’d show you how to make this simple applique zippered bag. 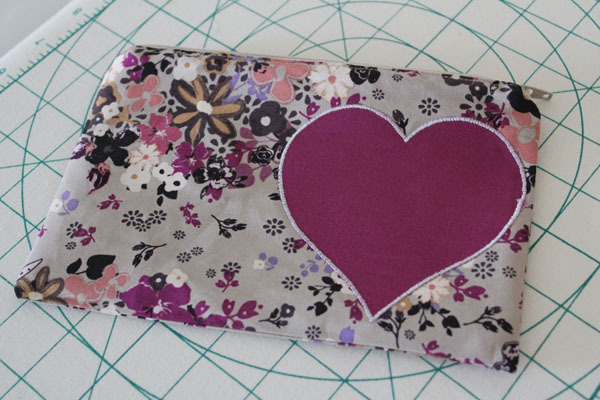 Super fast and easy to make, once you get it down, you’ll be making all kinds of zippered bags! Applique shape cut out with fusible web on the back. 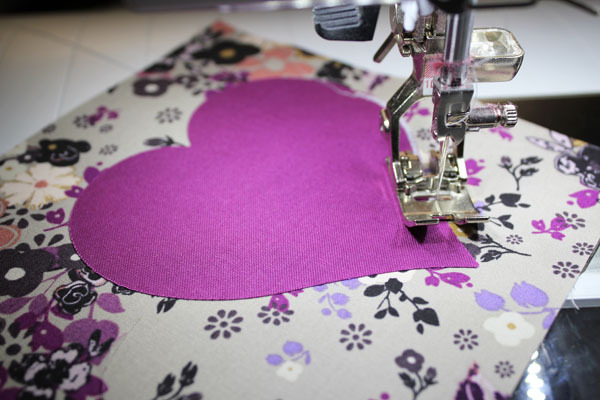 Fuse the heart onto one of the outer pieces, stitch in place. I used a tight zig-zag. Place one outer piece and one lining piece, right sides together, with the zipper between. 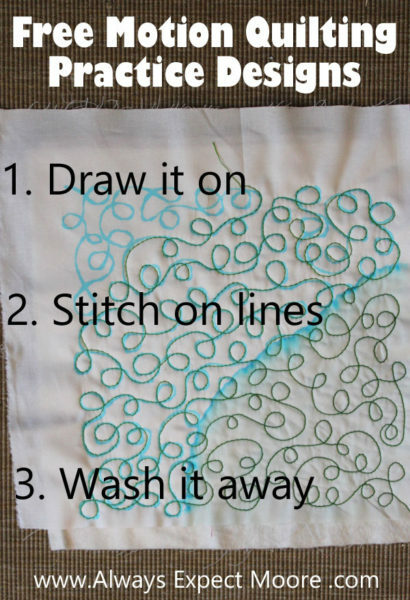 Stitch through all three layers. 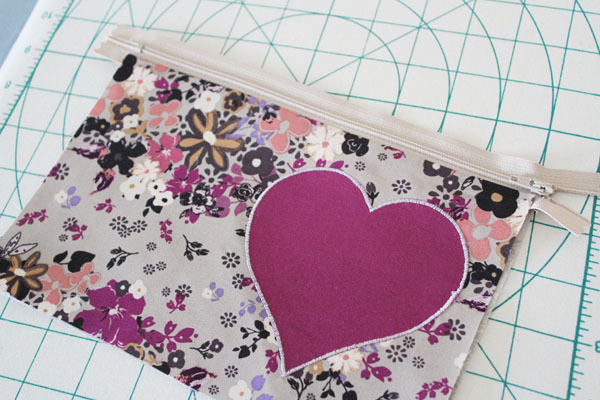 If the zipper pull gets in the way, stop stitching. 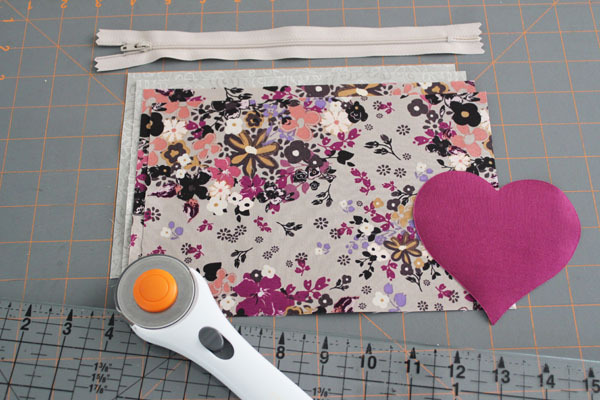 With the needle down, lift up the presser foot, and carefully open or close the zipper to move the zipper pull out of the way. Press them open, exposing the zipper. 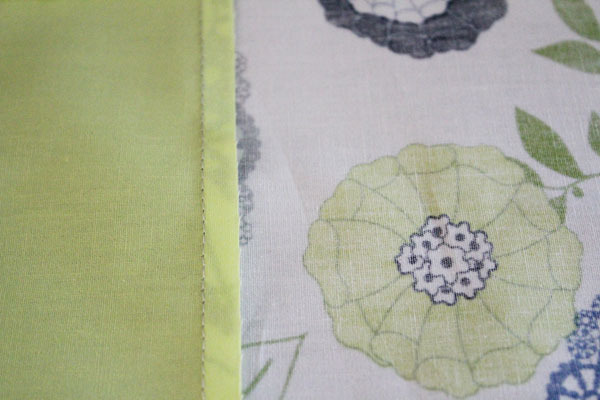 If you like, add topstitching along the top of the fabric. Repeat with the other set of lining and outer fabrics. 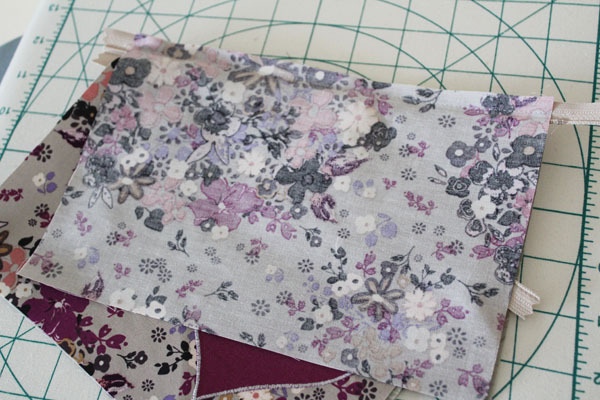 Once you press open the second set, lay the fabrics so that the outer fabrics are right-sides-together, and the inner fabrics are right-sides-together, with the zipper in the middle. VERY IMPORTANT: Open the zipper at least halfway. This will keep you from swearing later. 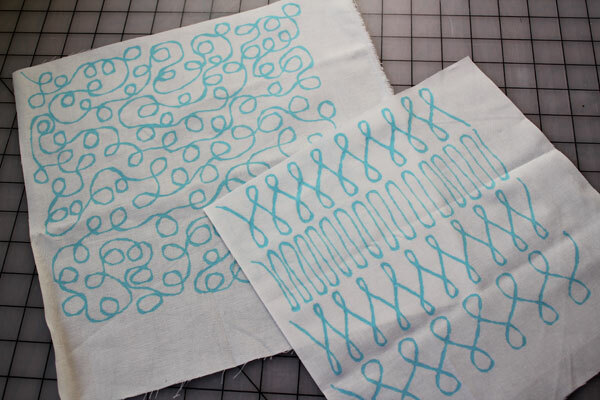 Then stitch around all four sides, leaving a hole about 4″ long along the bottom of the two lining pieces. Trim off the excess zipper, then turn the bag through the hole you left. Hand-stitch the hole closed, and you’re all done! Last year, I was really cranking out quilts – at a rate of about 2 per month! 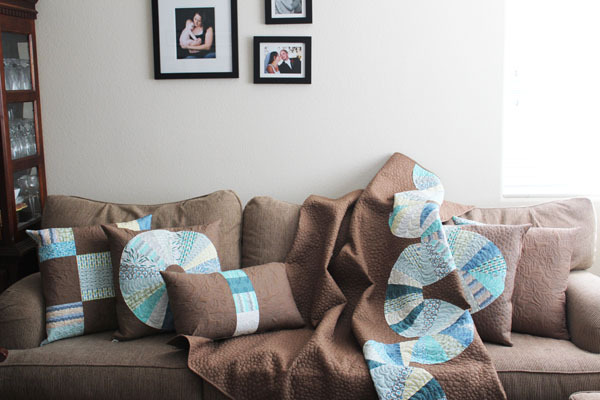 Yes, that is a lot of quilting! I love making quilts, and still have a lot of UFOs, as well as quilts on my wish list. But I really don’t need to make another mountain of quilts this year. 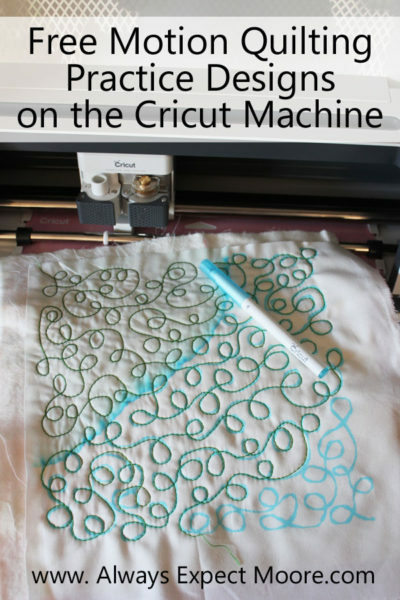 To get that quilting satisfaction without all the time (and fabric!) 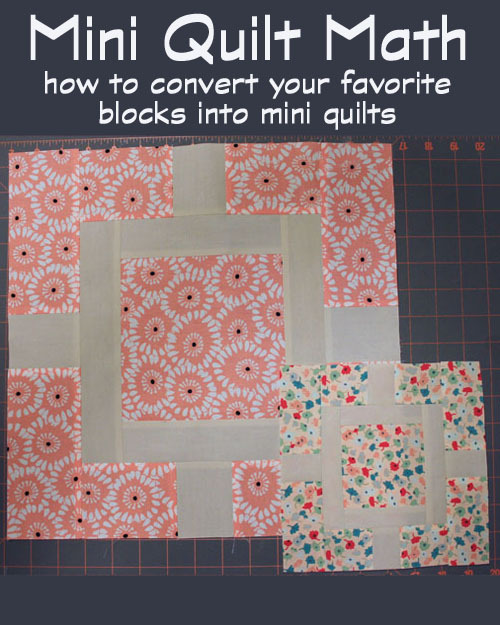 commitment, it makes sense to make mini quilts. 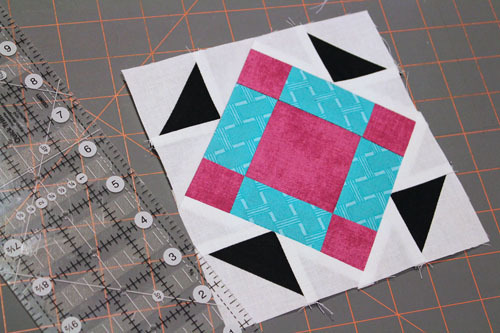 Several designers have started offering mini versions of their popular quilt patterns, but not every pattern is available as a mini. 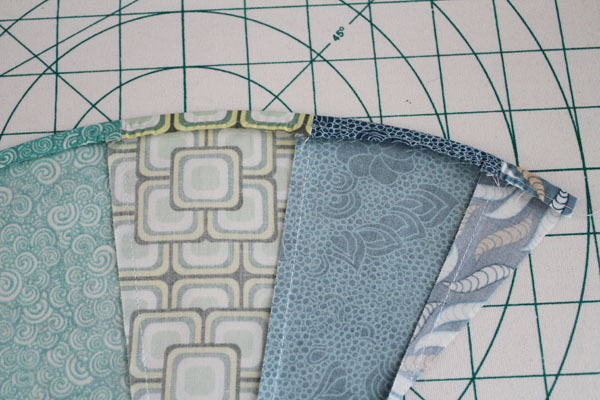 Instead of just crossing your fingers and hoping that your favorite patterns will be offered as mini patterns, I wrote a two-part post for Craftsy on how to use basic math to convert standard patterns into mini quilt patterns. 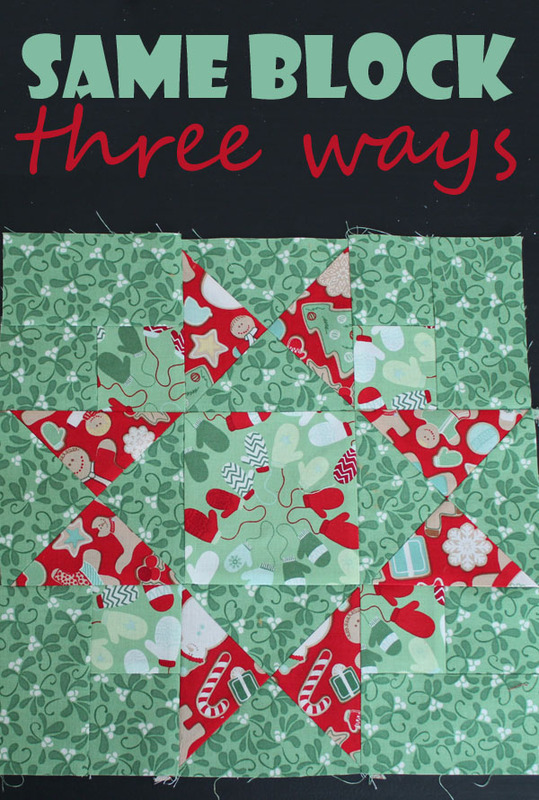 The first post is on basic mini quilt math. I take you through the basic steps, and at the end of the post have some tips that will help you in creating your mini. The second post is more advanced mini math – half-square triangles. 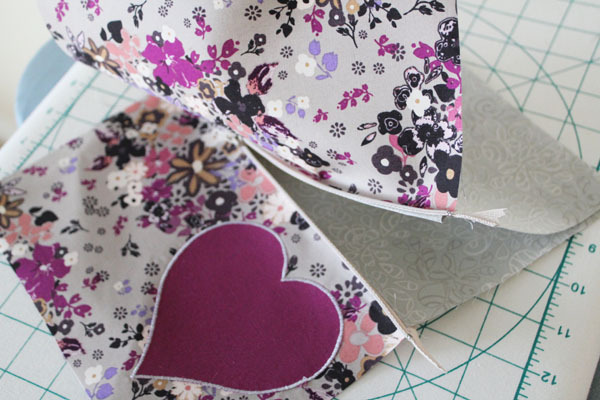 It seems like they would be tricky, but if you know the “magic number” for HSTs, it is super easy to figure out how to make your mini. For years, I’ve been bothered by clipping my corners when making projects. 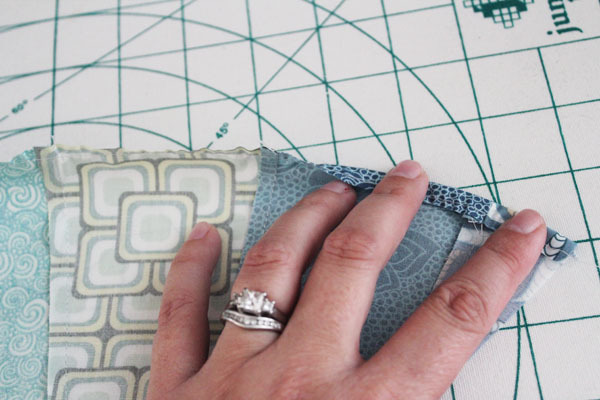 Making bags, pillows, whatever, the instructions call for clipping the corners before turning. 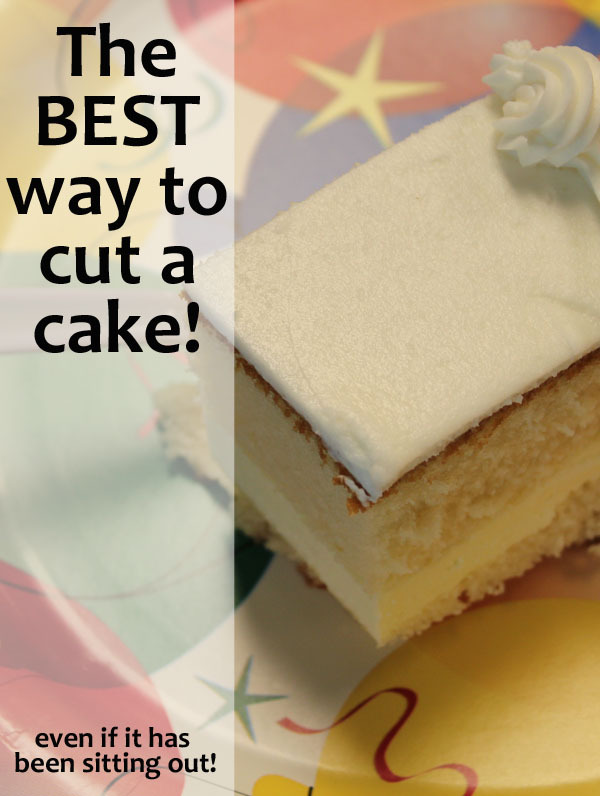 The reason you clip the corners is to reduce bulk. 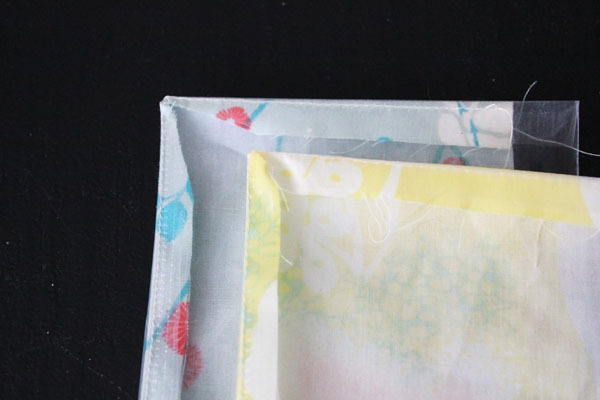 If you don’t trim away the extra seam allowance before turning, you’ll end up with a lot of bulk in the corners, which makes for unattractive corners. However, when you clip right across the corner, you weaken the seam. After all, part of the job of the seam allowance is to lend support to the seam so that your stitches don’t pull right through the fabric. And cutting away all that seam allowance (leaving just a thread or two to carry the load) has never sat well with me. Especially since the corners of pillows and bags tend to take a beating – so that’s exactly where you would want strength. I don’t want to start advocating that everyone stop clipping their corners, resulting in a bunch of bulky, unattractive edges. That isn’t a great solution either. 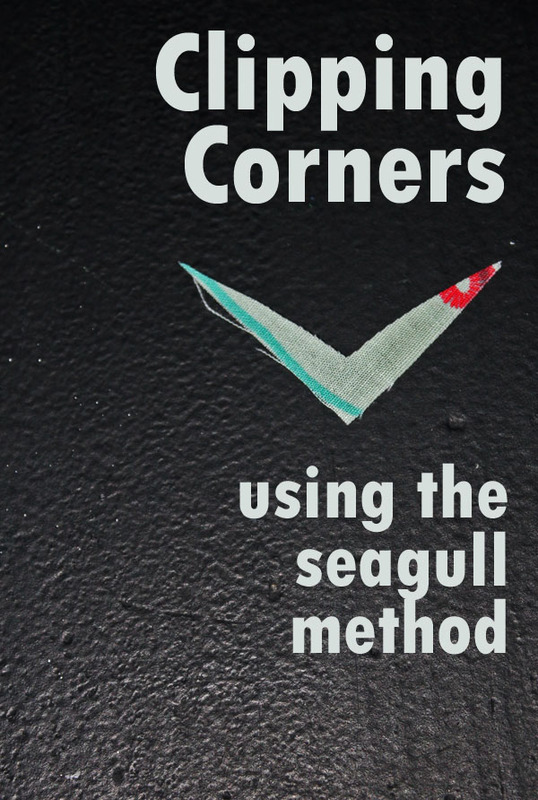 So, I’ve come up with a new way to clip corners, I call it “The Seagull Method”. Pretty arrogant, right? Stitchers have been clipping corners the same way for centuries, and here I come along with a new-fangled way to clip. Well, read on, and feel free to tell me in the comments if you think this is stitching genius or sewing blasphemy. 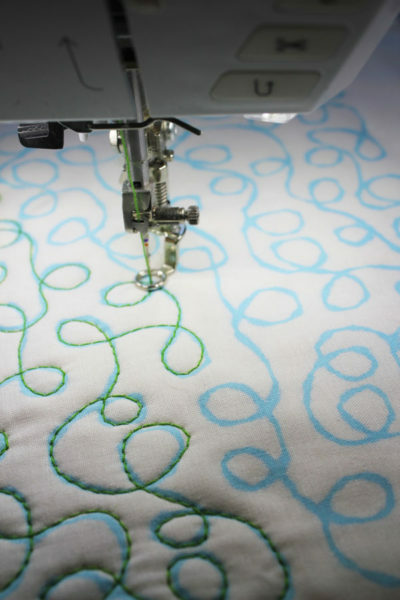 So (or should I say “sew”…), the Seagull Method. Why call it that? Because instead of cutting off triangles, the pieces clipped off the corners look like little seagulls. You know, the little v-shaps seagulls look like when they’re flying way up high? Which is a great way to remember exactly what the method is. 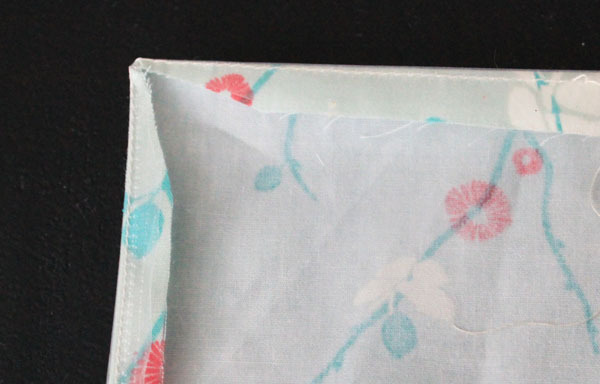 To demonstrate, I stitched a plastic bag to two pieces of fabric, and clipped the corners. On the left is the traditional way of clipping a corner. At an angle all the way across. On the right is the Seagull Method. I start about an inch from the corner and taper in, getting about 3-4 threads away from the corner, and then do the same on the other side. Clipping off a little seagull-shaped bit. This takes away more bulk, and spreads the removal over a larger area, keeping as much strength as possible in the seam. But the real magic comes when the seams are turned. When we turn a traditionally clipped seam, we see this on the inside. 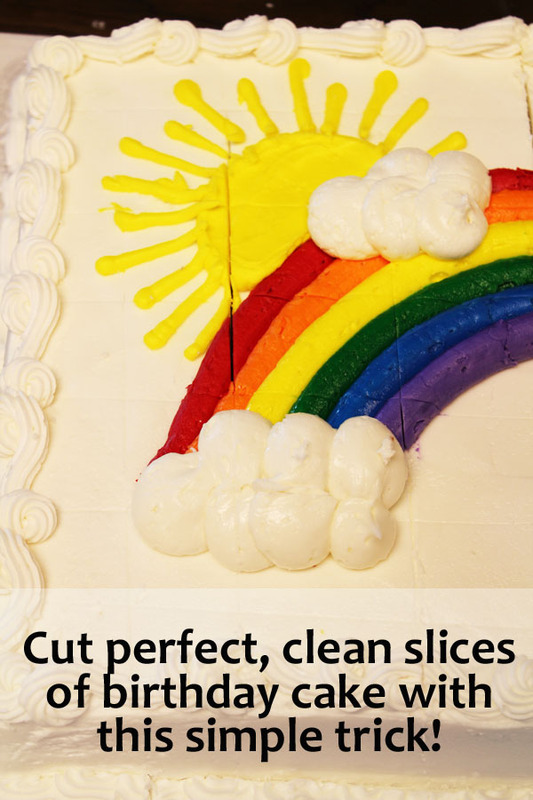 The two cut edges but up against each other, and the corner lies flat thanks to the removal of the bulk. 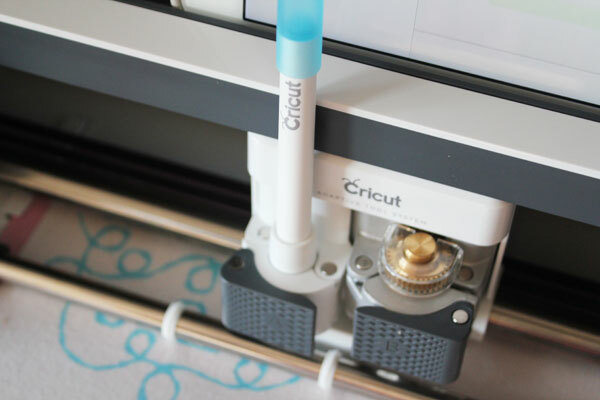 The bulk is removed in the entire corner, making it very easy to insert a corner-turning tool to poke the corner out. There is a small increase in the bulk right in the corner (since we left 3-4 threads instead of only one), but the entire corner has been strengthened. 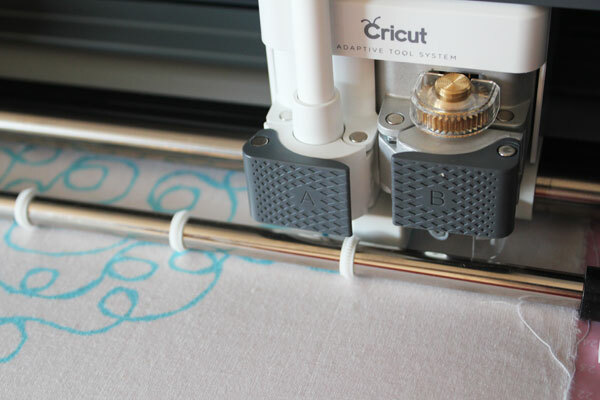 This corner-trimming method works on all kinds of projects, helping to reduce the bulk without completely weakening the seam. 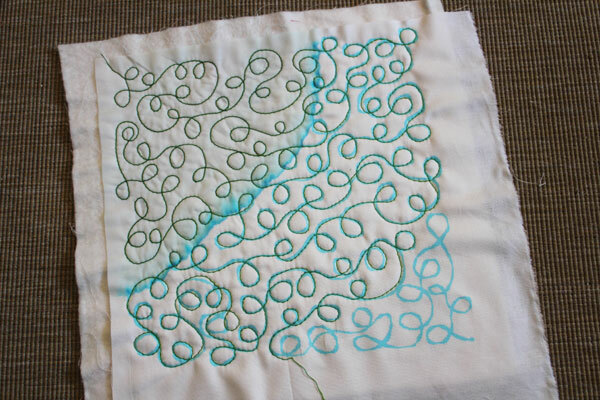 In any case where I don’t plan to top-stitch along the corner, I think the Seagull Method results in a stronger seam. 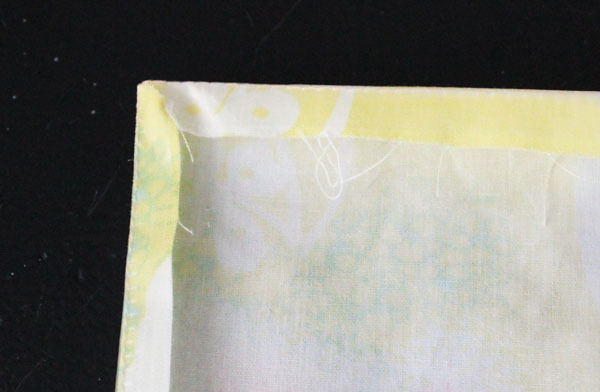 However, if I plan to topstitch along the corner, as you can see from the images, the traditional method leaves more fabric in the corner seam. 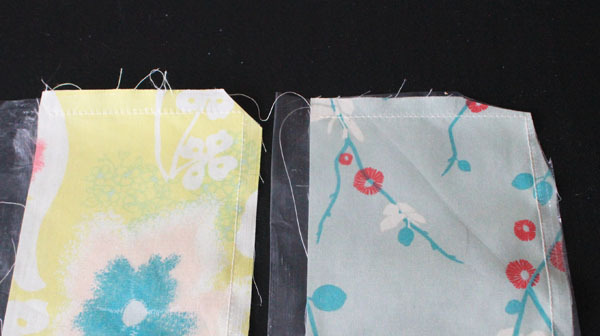 This additional fabric will help to strengthen the corner when it is topstitched, making traditional clipping better. What are your thoughts? Will you be clipping corners differently from now on? 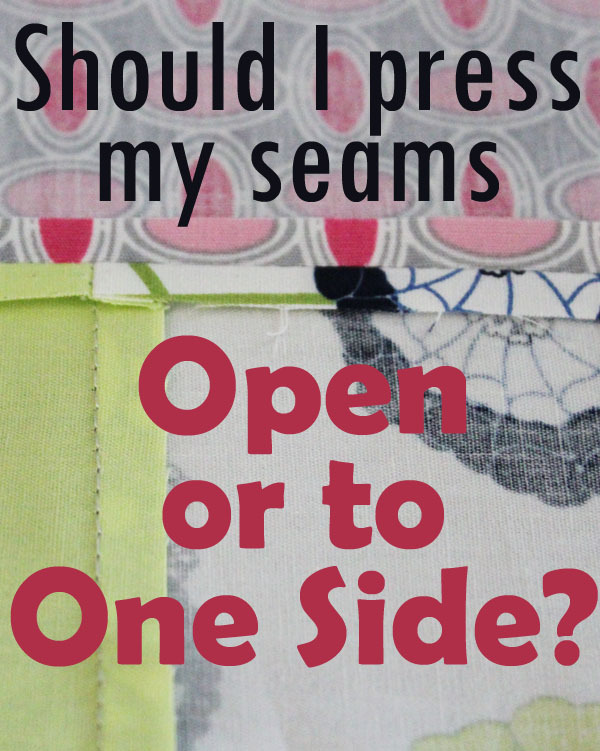 Or will it at least cross your mind every time you pick up your scissors and get ready to weaken a seam? One of the best things about having a school-aged kid is the fun projects. Yes, I’m going to be coming back to this post in a couple years, after drowning in school projects, and laughing at my former self who got excited when teachers asked for help. But right now, in this moment, it is pretty awesome. I love helping out in my son’s classroom, and this is one of those fun projects. Little Moore’s teacher is a self-described non-crafty man. I offered to help out with some crafty projects, as needed. 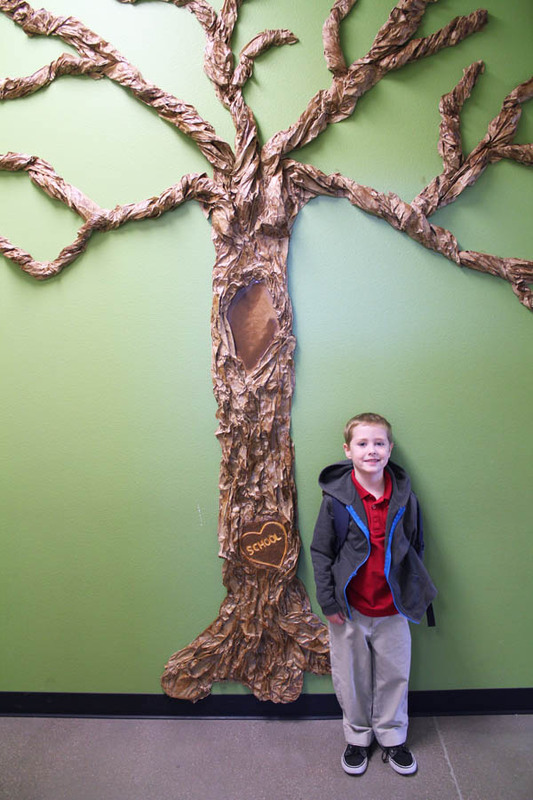 He wanted a big tree in the hallway that could be changed out for the seasons. Basically, just the trunk and branches. I told him that not only would I make it, but it would be awesome. Because I’m a lot of things… but humble is not one of them (however, awesome is totally one of them – ha!). I’m not giving you a step-by-step here because I’m pretty sure that the demand for giant tree tutorials isn’t worth the time it’ll take me to edit the photos… but I’ll give you the highlights. I prepped the trunk at home. I used Foamcore cut into the right shape. The “carving” on the tree is a piece of styrofoam. 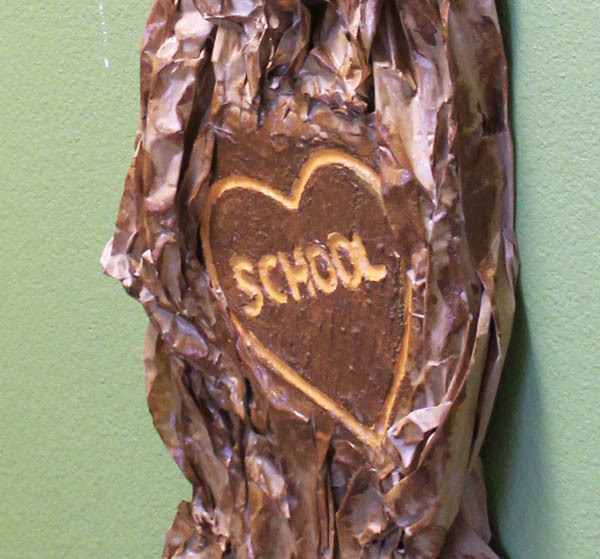 I carved the heart and the word “school” into the heart, then covered it in Smooth Finish. After the Smooth Finish hardened, I painted it brown, with the carving a lighter brown so it would really stand out. At the top of the trunk, I put a piece of cork. This way the teacher can easily switch out things in the hole in the tree. I lined up my foam core, styrofoam, and cork pieces, and Duck Taped them together. I used some extra cardboard on the back to give some extra strength to the seams. Then I added on the bark. The bark is crumpled up paper from a Fed Ex Box. It was already crumpled up, which was perfect. 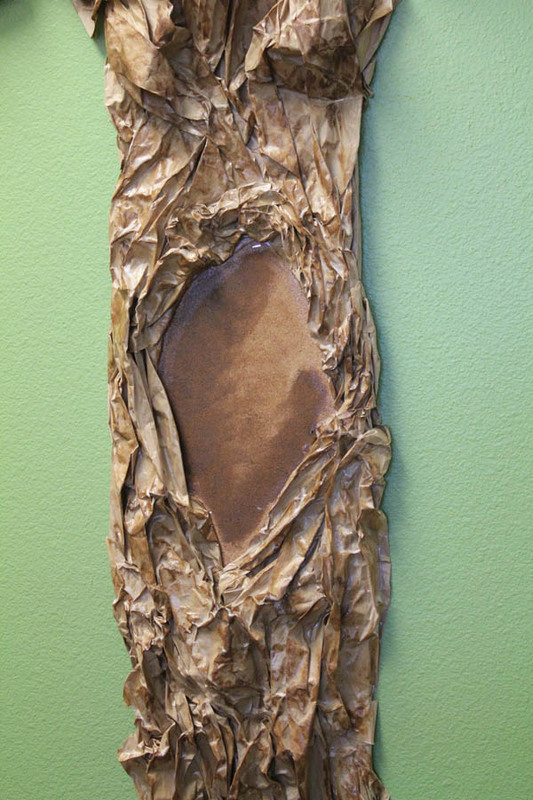 I just wrinkled it more, and used a TON of Mod Podge to secure it onto the tree trunk. Lots and lots of texture. Once that all dried, I used a sponge and some brown paint, lightly went over the whole trunk with the brown paint in spots (more texture!). Then gave the whole thing a thick coat of Mod Podge. So thick that it isn’t fully dry in these photos, and you can see some of the white! The branches were fun to do. When I put the rest of the brown paper trunk on, I left 5 long pieces hanging off of the top, then took the trunk to school. I used a staple gun to secure the tree to the wall. Then I twisted the brown paper branches into place, using the staple gun to secure them. I tore off any extra, and added sub-branches off the 5 main branches. 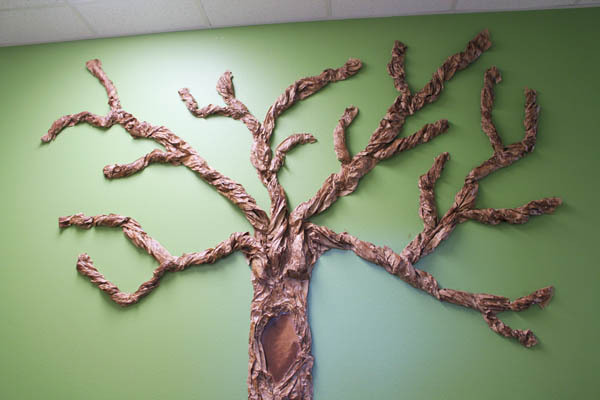 Once all the branches were up, they got a quick swipe of brown paint sponged on, and then a coat of Mod Podge. It took about 5 hours at home, and about another 2-3 at the school… but this tree looks awesome. Any volunteers to try to take it down at the end of the year? Recently, I made 3 different blocks for a swap. Well, they look different, but really they are the same. They all use green and red fabrics from Kate Spain’s line “In From the Cold” for Moda Fabrics. And they all actually use the same block pattern… but by switching up the color placement, and the amounts of red and green in each block, I ended up with three completely different blocks! This is a great exercise when playing with color. Different colors, in different places, make the same block… not so much the same. When the wonderful folks at Art Gallery Fabrics asked me if I’d like to play with some fat quarters of one of their new lines, I got giddy. Seriously, playing with fabric always makes me a little giddy, but playing with brand new fabric that magically arrives in my mailbox is cause for extra excitement. 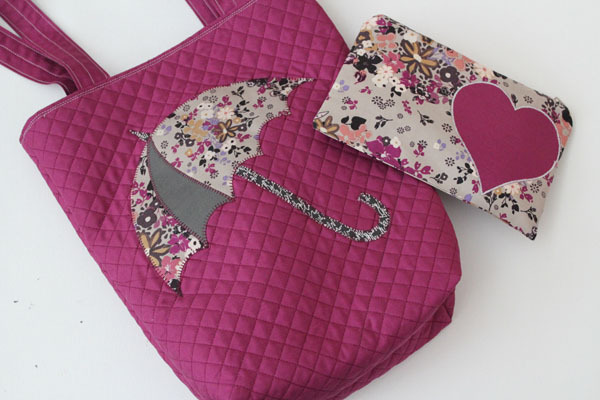 AGF has several new lines coming out, but I love the new “Legacy” line by Angela Walters. First, because I love Angela Walters’s work. 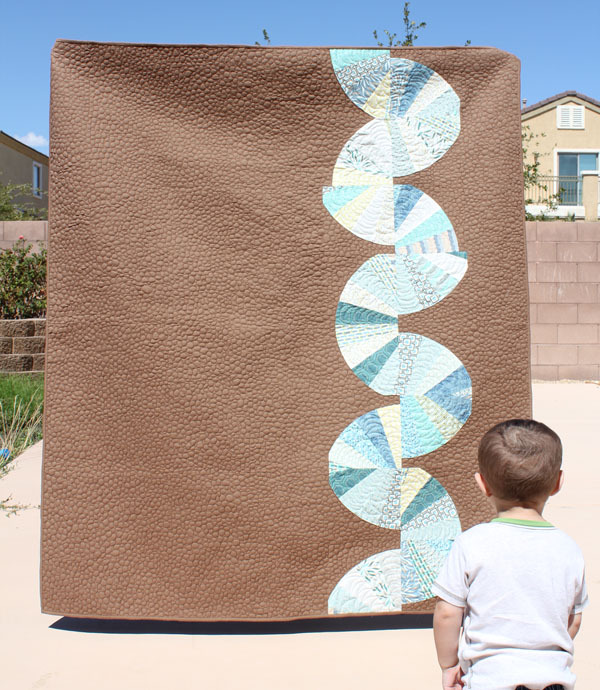 She is an amazing long arm quilter, and I’m always in awe of her incredible work with the negative space that modern quilters love to leave in quilts. But also I loved the colors and designs in this fabric. Many modern fabrics have very bright colors. I love bright colors. I really do. 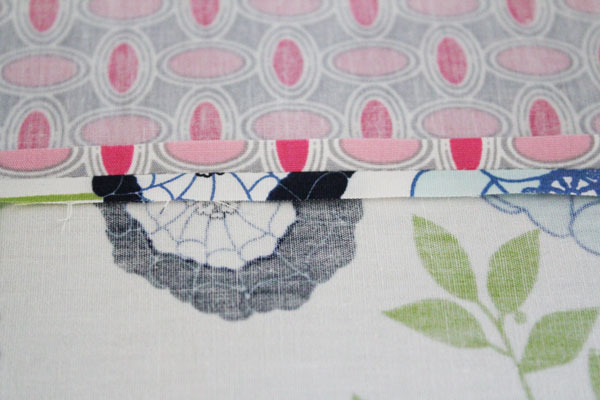 But sometimes fabric that feels a little more neutral fits the bill. This fabric reminds me of blue jeans and work shirts. There isn’t a single plaid or rivet, but it has that homey, comfortable look to it. Like Saturdays. If you don’t understand what I mean, check out the fabric in person, I think it’ll start to make sense. 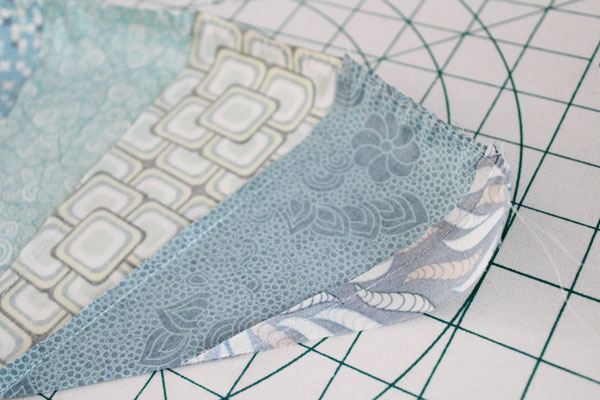 I took my AGF fat quarters to my local quilt shop to find a good solid to go with them. I ended up with this great burlap-brown color. Brown isn’t a very modern color, but burlap is very “in” with crafters, and since I’m kind-of a crossover crafter/quilter, this seemed like a fun choice. I love the name of this line, “Legacy”, which Angela so named because of her Grandfather. As I was working on this quilt, I thought a lot about my boys. My oldest just started Kindergarten, and on a recent Facebook post about my son growing up, a friend reminded me that as a mom, it is my job to give my son roots and wings. I hope you can see the roots and wings in this quilt. This quilt is fully double-sided, I pieced Legacy into the back as well. 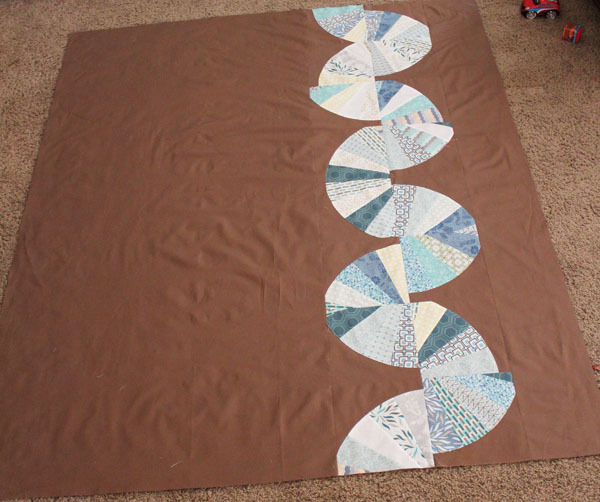 I was careful with the placement of the piecing, and let my long-armer know my intent… so the quilting on the curves of the front shows up in these giant stacked-coin pieces on the back. 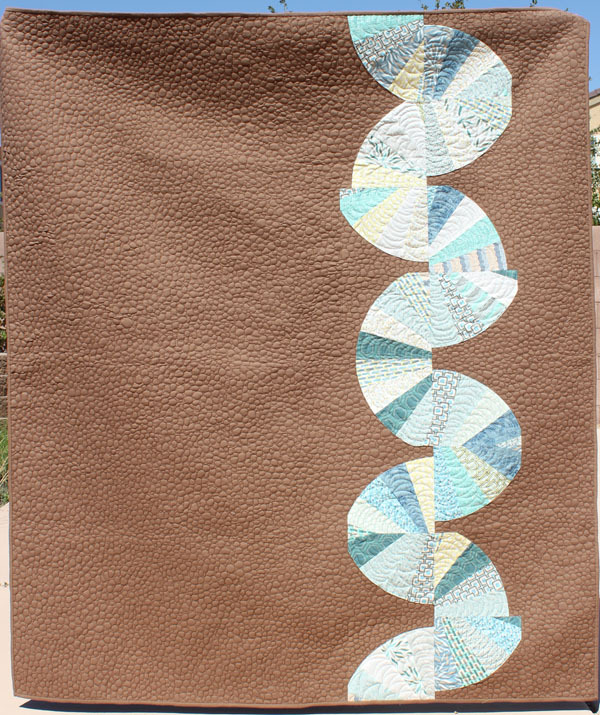 I did the piecing on this quilt, but I handed it over to my friend and long-arm quilter Nichol of A Desert Quilter to do the quilting for me. We decided on the pebbles for the negative space, and I think she did an amazing job. 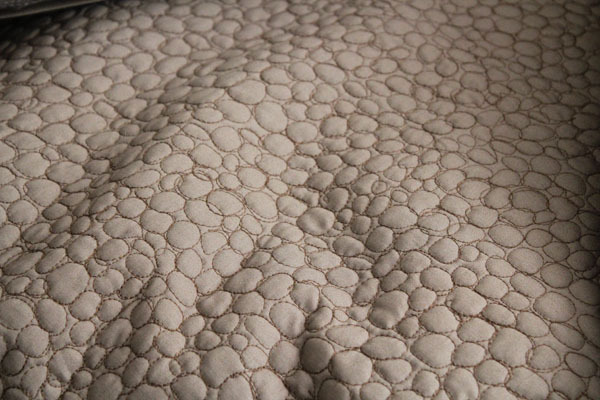 Here is a closer look at some of her quilting. 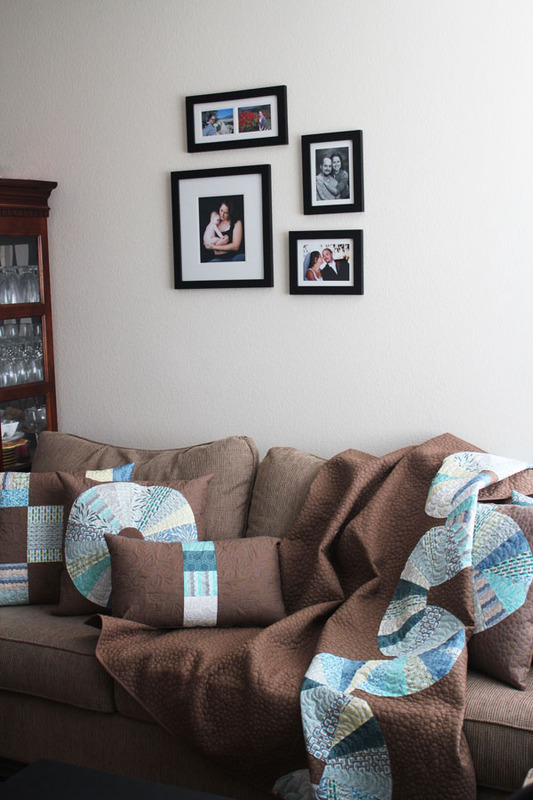 It should have taken her practically forever to do all this quilting – the finished size of the quilt is nearly 60″ x 70″. But, she got it all done for me in less than a week! I have been wanting to re-cover the throw pillows in my front room almost since the first day we got them. They came with the couch and although they were fine, they weren’t my style. I would have loved to re-cover them with wild quilting patterns, but my husband is more a fan of builder’s beige. Since I had so much brown in the quilt, I knew I’d be able to get away with making pillow covers that went along with this quilt. 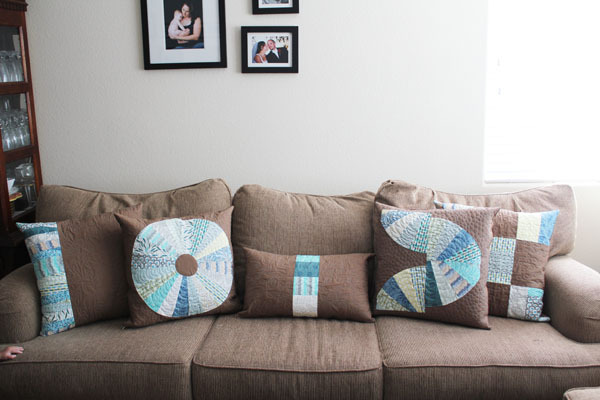 Nichol did the quilting on these pillow covers as well! I’m loving the style it brings to my front room! This is the first room that guests see when they walk into my home, and it has always bugged me that I don’t have much handmade in there. That problem has been more than solved with this new quilt and pillows! There is now plenty of handmade… but not at all in a kitschy way. I love me some kitsch… but probably not for my formal living room. Start by making quarter dresdens. 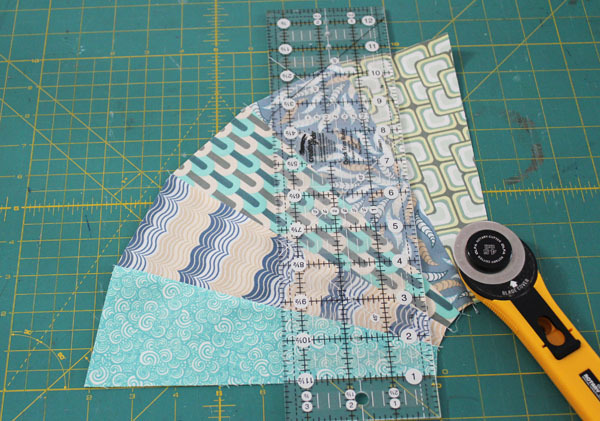 I used the Easy Dresden Ruler to cut wedges out of 8″ wide strips of fabric, then shuffled up the wedges and stitched them into 16 sets of 5. I then squared up the edges of each, making one side even, and when evening up the second side I cut away at the hole traditionally left for the center circle of the Dresden plate. On half, I cut the right side off, and on the other half I cut the left side. 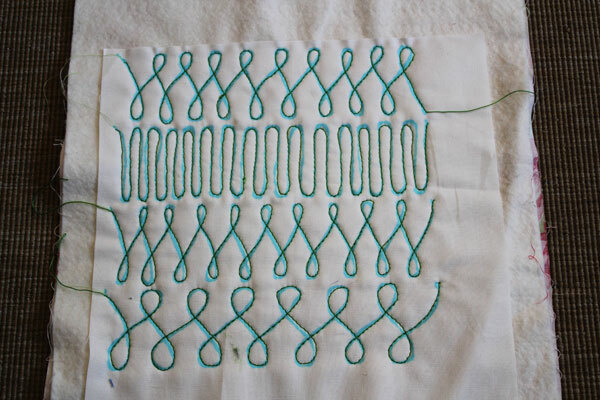 Using the basting stitch on my machine (making the stitch length as long as possible), I stitched about 1/8″ from the curved edge, leaving long thread tails. I then pulled one thread a little, making the edge start to gather so that it curved up. I spread the slight gather evenly across the whole curve. I then gently folded in the curved edge about 1/4″. Try to be accurate, but if it isn’t perfect don’t sweat it. I pressed this edge down, and had the perfect edge to top stitch down onto my block. 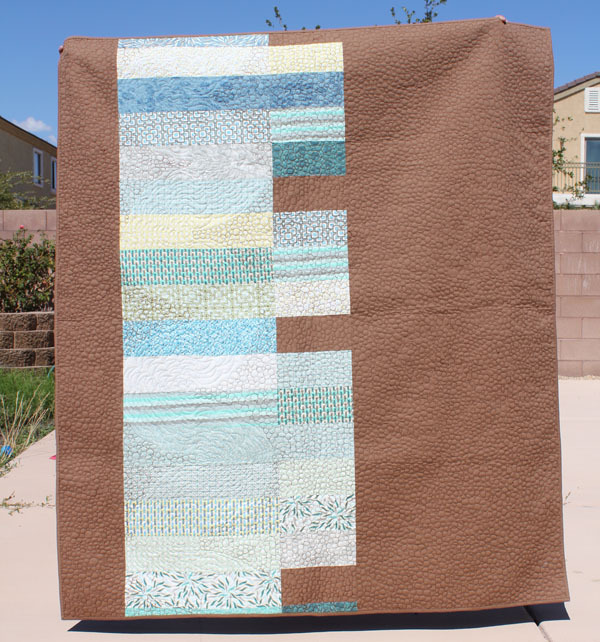 I cut 16 squares from my background fabric, each 9″ square. 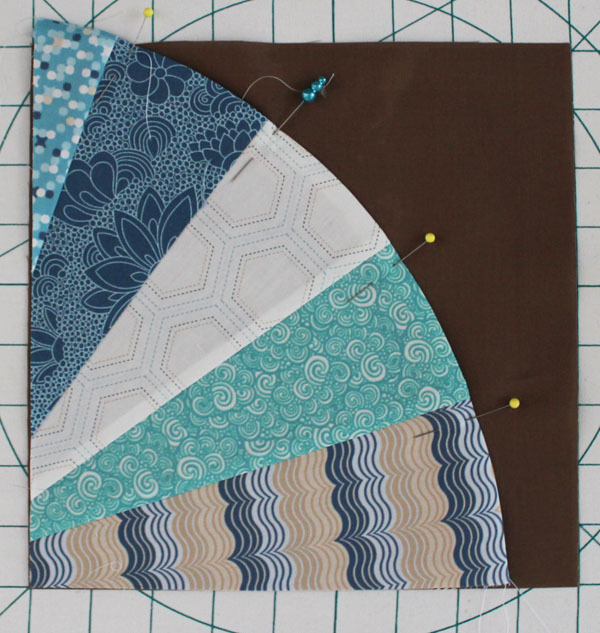 I pinned a chopped quarter dresden onto each. One side is longer than the other. 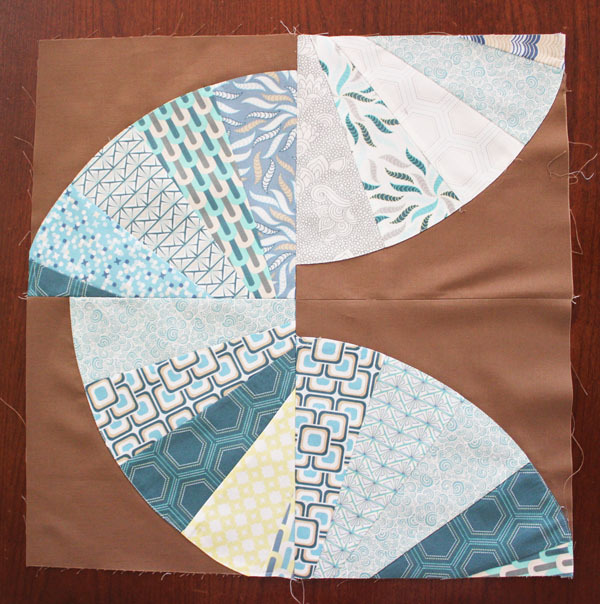 That gives the final quilt blocks a little more of a wonky look. I top stitched the edge of the dresden down, right on the edge of the curve. At this point you can cut away the excess background fabric behind the dresden, but I left mine on. Put the squares together into sets of 4. 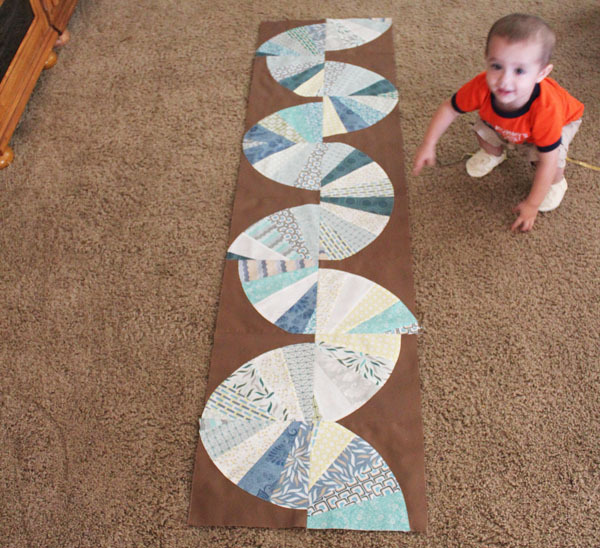 Then sew these blocks into a row to make the roots and wings design. I then added yardage to each side to finish the top. I cut the backing fabric into the length I needed, then cut off the selvedge. 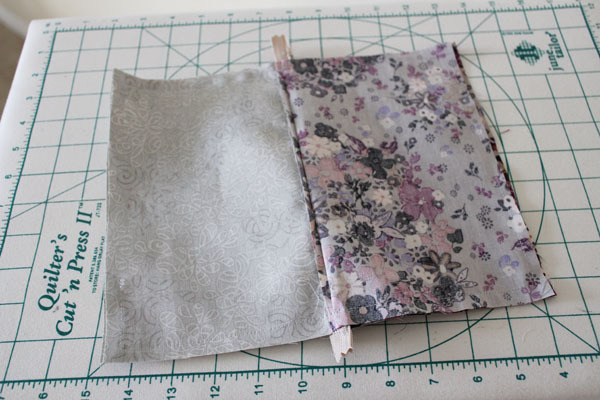 I cut 9″ of the fabric off, down the length of the fabric, to divide it into two unequal pieces. 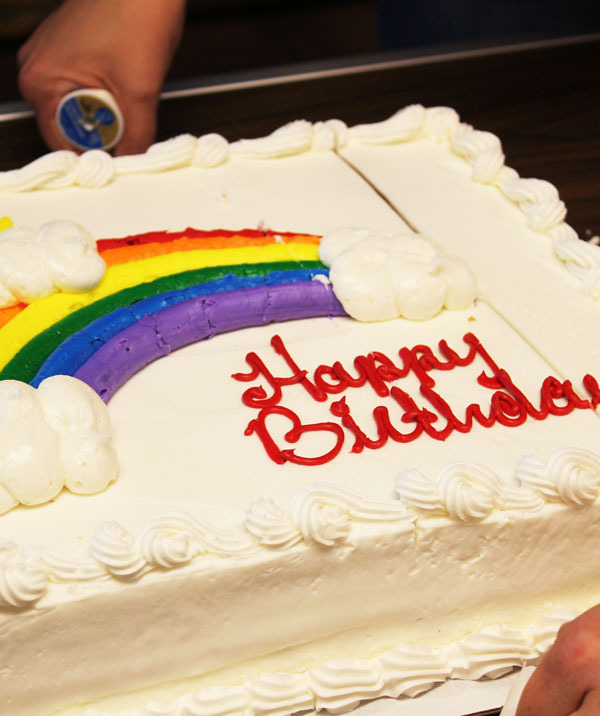 The 9″ piece went on one side, the larger piece on the other. 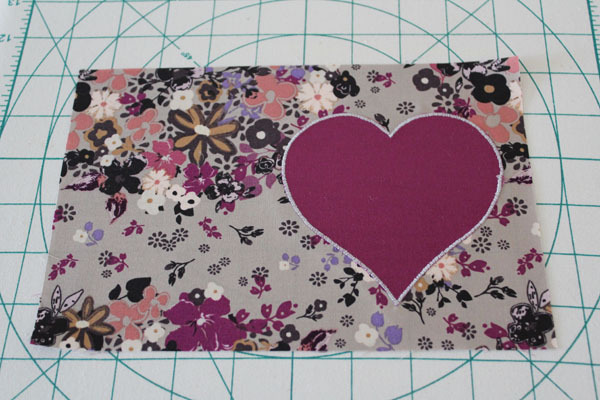 I then pieced together my backing and gave everything to Nichol to quilt. After she got it back to me I bound it with the same fabric I used for the background. I think this gives it a nice, clean edge. 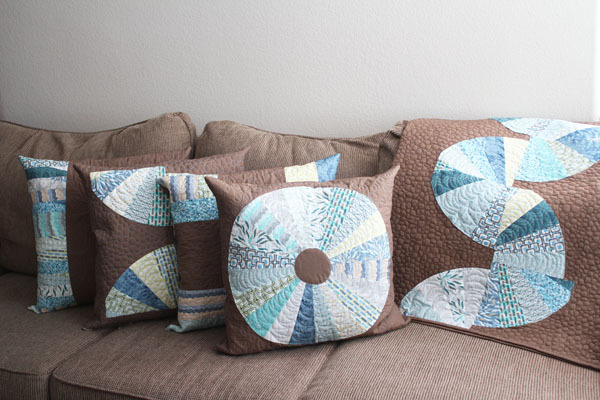 I trimmed up the sides and pieced these little pieces into a pillow! Here’s one more shot with my little helper. With his big brother in school, he’s not quite sure what to do with himself, so he “helps” me with my projects. You might have noticed him in one of the other photos… and if you scroll up, you’ll see his hand on the left side of the couch in the 5th photo from the top. So cute!